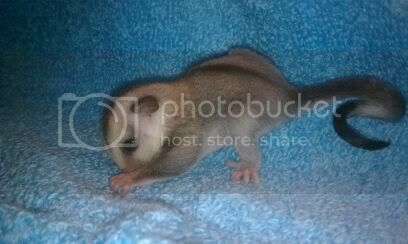 Register Log In GliderCENTRAL Forums Breeding & Babies Breeding 101 Breeding for Colors Why or how does sterility occur? SO, this is something I have been pondering and wondering for quite a while now and have never got around to asking. I have a little boy who I've been assured will most likely be 100% sterile. I was also reading the thread recently posted about the mosaic ring and sub-species being sterile. SO I guess my real question is why do lines become sterile? Does it effect their health in any other way? I think that simply because I don't understand it, it worries me. So can someone please explain it to me? Preferably a breeder or mod because I would like to know for 100% certain, as my little boy is most likely going to be sterile. Why do they assume your boy is from sterile lines? That is not something I would chance if you do not want babies or if he is with a sister or something like that. From what I know the sterility came from gliders being so inbred. A female from sterile lines can still have babies but will pass the sterile gene onto most male offspring. From what I was told his brothers are also sterile. Something about the breeding line? I am just curious why it occurs. He has shown no signs of maturing, no bald spot, etc. Like I said I was assured he would be sterile, but I still keep a close eye. There are several mosaic lines. Some are "sterile" lines because when the mosaics first popped up, the breeders who had them didn't understand how the gene worked. They thought that like Leus, that both parents had to carry the gene to produce the offspring. Because of this, they inbred them to produce more. The inbreeding caused the sterility. They then learned that only one parent has to have the gene to pass it on to their offspring (like with wf). Also like the wf, there are no mosaic "hets". Either the glider IS a mosaic or it isn't. There is the Snow White line of mosaics that are NOT sterile line mosaics. (my mosaics are from the Snow White line) I can never remember if there is another non sterile line or not. Yes, I'm glad my breeder was honest about it. I would love my little boy no matter what. Thank you for the info Dancing, I really appreciate it. I actually just pmed you about something else. If he is housed with his sister, I would still take him in to get neutered. You do not want to risk brother/sister babies. Males can breed without a bald spot; it is not indicative of fertility or maturity. The vet will be able to tell you if he has testicles that have dropped. Also the sub species are not sterile. 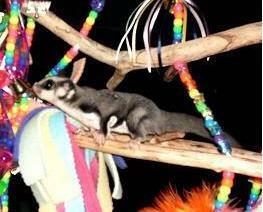 However when they are bred to a normal glider the off spring males of the cross between sub and normal are sterile. And the females will produce sterile. Dancing .. please don't be so sure that the snow white line is free from it's own set of issues, maybe not sterility from what is written in the database, we have no idea what was done before that..
here is something I just posted elsewhere regarding the sterility and what the database tells us..
and there definitely is not the info in there of what was going on with helen morenos breeding program, the only gliders listed are the ones that priscella has already used and expanded on, but even still further back there are some real issues.. 2 gliders with no lineage just thrown together do not produce sterile lines as in champ and tilly and her new lines of cardie which she has added to the non sterile lines of corkey unless there were either issues before some serious serious inbreeding within inbreeding or mixing the subspecies which has proven sterility.. (mickey and minnie proved the inbreeding alone won't cause sterile lines) and the intense inbreeding linebreeding and inbreeding alone won't cause sterility if the pie bald attempts are looked at.. He has been going - the vet has said the same thing. No signs of maturation at all. He also agreed with the information my breeder provided. That level or repetitive sterility is usually permanent. But I will always keep a close eye. He goes monthly until we're 100% sure. The vet said that would be around a year to a year and a half. What are your monthly vet visits for, and what will be around a year to a year and a half? To be sure he really is sterile? I keep getting conflicting advice on this. This is my first time dealing with sterile gliders. Last edited by Drea; 10/04/12 08:41 PM. I'm not positive on this, but if he's sterile, I don't think he would have testicles would he? Or is that just in some of the males? I don't understand why you would have to wait over a year. That was kind of why I turned to here, because I was unsure. I know all his brothers are sterile. I've just been trying to do what I can, because honestly if I don't need to neuter him because of sterility that's a LOT of money that I really need. My vet suggested doing this to be safe. I don't know. He is not showing any signs of maturation and he's 15 weeks. Have you felt to see if he has testicles? Ok, I just confirmed this with another breeder. The males, if sterile with either not have any testicles at all, or they will be pin sized and/or have a flat pom. They can have a bald spot and still be sterile. So, I would think that at 12 weeks OOP, the vet should be able to feel his testes and determine if they are of normal size or not. He does have a flat pom, no testes. He was just at the vet last week and that was the conclusion we both drew. And i look daily still, jic. Like I said he's 15 weeks now. sounds like he's sterile to me. Thank you Shelly, I appreciate it. I keep a careful eye just in case, their cage is at the foot of my bed. But I do think 100% that he is sterile, from the state of his physical body and from his lines and family members also. I was just curious why sterility occurs because it's not something I really understand. I have a male that is sterile, he never dropped his testes into his scrotum. He has a bald spot and a chest gland and is currently having a marking war with his little brother. The vet was able to palpate one testicle in his abdomen but it is too invasive to neuter him. With the testes in his abdomen, they are too warm and that kills the sperm. He is at a higher risk of testicular cancer because of this. Breeding between closely related individuals, called inbreeding, may on one hand result in more recessive deleterious traits manifesting themselves, because the genomes of pair-mates are more similar: recessive traits can only occur in offspring if present in both parents' genomes, and the more genetically similar the parents are, the more often recessive traits appear in their offspring. Consequently, the more closely related the breeding pair is, the more homozygous deleterious genes the offspring may have, resulting in very unfit individuals. For alleles that confer an advantage in the heterozygous and/or homozygous-dominant state, the fitness of the homozygous-recessive state may even be zero (meaning sterile or unviable offspring). Inbreeding (reproduction by closely related individuals) occurs in small and isolated populations. Inbred individuals are homozygous at many gene locations, allowing expression of normally recessive, deleterious genes. Common results are infertility, low survival rates and compromised resistance to disease. These results have been clearly documented in zoo populations and have been observed in several wild populations. In a decreasing population, inbreeding depression of reproduction and survival may accelerate a decline toward extinction. So you think he's infertile because he was inbred?????? Drea do you have the lineage on this male? It would tell you a lot if you could track his lineage back and see what lines he came from and if there was a lot of inbreeding. And I accepted him as pet-only of course, both my twins are. I don't mind - if I ever thought of getting a breeding pair eventually these two would never be involved in that equation, ever. I was just very curious about this topic. Those lines were inbred which is what caused the sterility. The sterility gene is then passed on to future generations. It does not mean that your particular glider is inbred. Drea, with all due respects, the breeder KNOWS whether or not he is sterile.. or they can tell you, obviously it isn't something she is unaware of. she sold that glider to you knowing it was from sterile lines.. I listed several reasons why a glider can be sterile.. and the foundation lines of some of the base gliders showed sterility , those lines they were trying to "breed out" placing them with other glider to remove the sterility.. this is not an uncommon practice, although looked down upon by some, it is a fact of life with all animals.just as the liger.. the females produce sterile males. 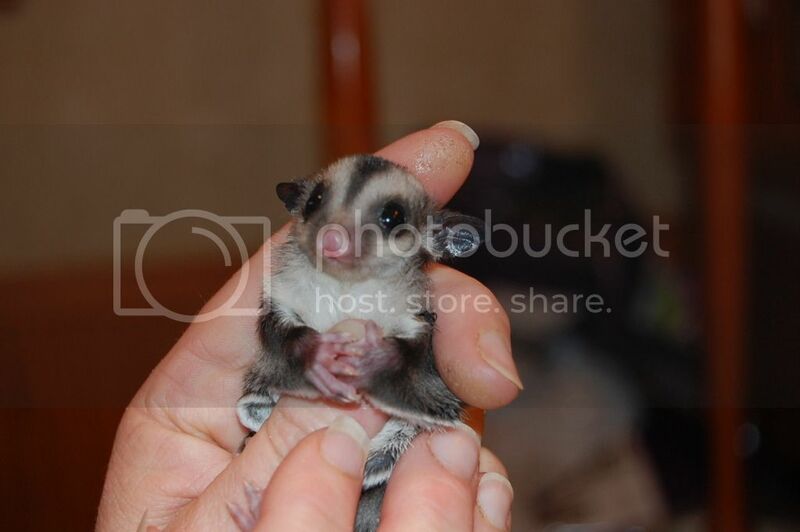 they can and have tried to breed it out, but it still happens, that comes from cross breeding the sub species of a given species.. for example since the Carmel glider is a different subspecies than the standard sugar glider if cross bred they would and have produce a sterile line from the beginning.. although some people are being advised against it, there are others that are doing it anyway. so they will try to out breed them, and probably sell the offspring to unsuspecting people, or claim they are from a current sterile producing line.. they may sell them with knowledge and sell them as pet only..
most of the lines that have been heavily inbred are not the sterile lines.. so that blows the inbreeding as a cause out of the water.. The line of mickey and minnie have proved that, also with the early WFB lines of cereal..
the sterile mosaic lines have some pretty strange looking gliders that peaked the interest of many of the larger breeders, to try to get some of the genetic markers onto the other mo lines. we are seeing things pop up now that have been around, not spoken of and honestly it has some of us concerned.. so people NOW are thinking... well time to clean up the lines. To my knowledge my mo lines are not attached to the sterile lines producing or not.. but that may change as more and more breeders are putting the sterilty in their remarks, I may find out that mine is actually associated with it by distant parentage..
but it is your responsibility as an owner that got a glider as PET only KNOWING it's brothers were sterile.. to at all costs protect that glider from breeding, any offspring at all from him, you will be adding to the problem, rather than help clear it up. IF you are not sure it is sterile, then you need to make sure, before you put him in a cage with any female.. especially his sister.. I have a male here that is sterile, after 6 generations of being sterile producing lines, and 14 other offspring that wasn't.. so for me.. the sterility is clear.. at anytime it can raise it's ugly head..
Shelly, in this particular line and I can point you to a few more.. but here the sterile lines were blended with the plat lines.. (thought you'd be interested in that).. but if you follow the sterility there was no inbreeding at all.. but you can also see where more and more people are marking their lines in their remarks.. now this is only 1 straight line.. and each generation also had producing males and definitely producing females.. so those spread out like out of control crab grass...both ways each generation.. Bourbon, you keep siting Mickey and Minnie as proof that inbreeding doesn't cause sterility. But all it proves is that it doesn't ALWAYS cause sterility. what sterile lines have heavy inbreeding in them?